Dental caries is the most common and transmissible disease of childhood having high prevalence all over the world is a multifactorial disease caused due to occurrence and interaction between dental biofilm and oral microflora. This microflora includes primary colonizers as well as secondary colonizers, of which Streptococcus mutans and Streptococcus oralis are one of the early colonizers responsible for plaque formation. S. mutans is considered as bacteria with high cariogenic potential because of its acidogenicity and aciduricity, ability to form extracellular glucans from sucrose, and conversion of sucrose to lactic acid. Apart from S. mutans, other bacteria such as lactobacilli group and Candida albicans are responsible for dental plaque formation and maturation too. Moreover, to maintain oral hygiene effectively preventing dental caries, various antiplaque agents are used in day-to-day practice. Currently, a wide range of mouth rinses containing chlorhexidine (CHX) and/or sodium fluoride, and essential oils are available commercially. The American Dental Association recommends that mouth rinses should be effective to modify the oral microbiota selectively eliminating pathogens without affecting the normal commensals of the oral cavity. CHX digluconate is most commonly used chemotherapeutic antimicrobial agent. It has broad-spectrum antimicrobial activity without any systemic side effects. However, it shows certain limitations in its usage due to staining of teeth, restorations and soft tissue, enhancing calculus deposition, unpleasant taste, taste alteration, burning sensation, and mucosal irritation. In recent years, extracts of active ingredients from medicinal herbs have gained attention of researchers all over the world in an attempt to find an alternative to chemotherapeutic agents. As these herbal medicinal ingredients have similar efficacy as chemotherapeutic agents without any side effects, the search for them continues. Trachyspermum ammi, that is, ajowan or ajwain is one of the similar herbal plants seen in Southern Asia including India, seeds of which are used as a spice. It has therapeutic activity against multiple gastrointestinal ailments, bronchial problems, and also acts as antimicrobial, antiplatelet aggregatory, and anti-inflammatory properties. Its oil is used in various lotions and ointments in cosmetics industries and as spice in many food preparations. Essential oil of ajwain contains about 50% thymol, a major phenolic compound has been reported to have germicidal, antispasmodic, antifungal, insecticidal, bronchodilator, and analgesic effect. It is also used in toothpaste and perfumery. T. ammi is an effective antibacterial agent against human pathogens including microorganism those are resistant to antibiotics. Despite the traditional use, in many areas of allopathic and ayurvedic medicine, its exact mode of action in the field of dentistry is yet to explored. Keeping these factors in consideration, we conducted an in vitro study to evaluate antimicrobial efficacy of pure extract of T. ammi oil against five oral bacteria. In this in vitro study, we aimed to determine antibacterial efficacy of T. ammi oil at different concentrations against five oral bacteria. Herbal compound, T. ammi oil is effective in reducing five oral plaque-forming bacteria. We carried out this in vitro study at the Department of Pedodontics and Department of Microbiology after gaining clearance from the institutional ethical committee, letter no. MIDSR/V/PG/5231/966/A/2016. Commercially available CHX gluconate 2%. All the bacterial strains were procured from IM-TECH, Chandigarh. A direct colony suspension of each bacterial isolate was prepared in brain–heart infusion broth and turbidity was adjusted to 0.5 McFarland Standard for all the bacteria. To determine the antibacterial activities, serial dilutions of T. ammi oil and chlorhexidine were prepared in brain–heart infusion broth.S. mutans, S. oralis, L. acidophilus, L. fermentum, and C. albicans strains were suspended in brain–heart infusion broth. About 1000 μg/ml concentration of T. Ammi oil and CHX were diluted in twofold serial dilution manner. Five microliter of each bacterial inocula were added to the test tube containing antimicrobial agents, respectively. The test tubes were shaken properly and incubated at 37°C for 24 h. Minimum inhibitory concentration (MIC) was determined by visual inspection and confirmed by spectrophotometry (OD600:0.6–0.7) [Figure 1]. Procedure was repeated five times to minimize error. Agar disc diffusion method was used to determine the antibacterial activity of T. ammi oil and CHX. Fifty microliter of bacterial aliquots from inoculum was spread evenly on culture plates with sterile swab in order to achieve an even bacterial lawn culture. 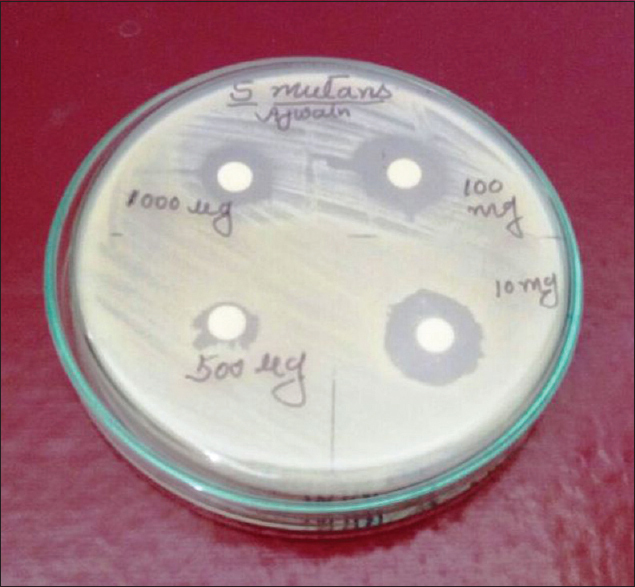 Sterile diffusion discs of diameter 6 mm, soaked in different concentrations of each antibacterial agent were kept at an equal interval and incubated at 37°C for 24 h in an aerobic conditions. Petri plates were observed for zone of inhibition, which were measured using zones scale in millimeters [Figure 2]. The tests were repeated five times to minimize errors. The data obtained were subjected to statistical analysis with SPSS version 22.0 Statistical Package for the MS Windows (SPSS Inc. Chicago, IL, USA). Intragroup mean and standard deviation was analyzed using paired t-test. Intergroup mean and standard deviations were analyzed using one-way ANOVA and statistical significance was analyzed using Tukey's post hoc HSD test (P < 0.05). [Table 2] shows MIC (optical density) and minimum bactericidal concentration (MBC) (zone of inhibition) values of T. ammi against five oral bacteria. Highest MIC values were found with S. mutans, L. acidophilus, C. albicans and lowest MIC values were found with S. oralis and L. fermentum [Graph 1]. Whereas, highest zone of inhibition was seen with C. albicans and lowest zone of inhibition was seen with S. oralis. However, no remarkable difference in inhibition zone was noticed with S. mutans, L. acidophilus, and C. albicans group, respectively. 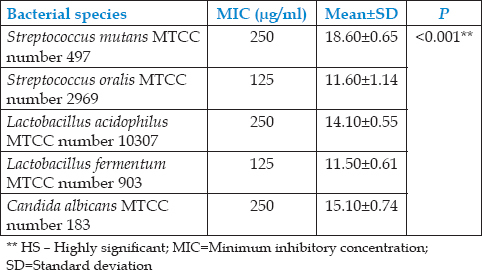 [Table 3] shows MIC (optical density) and MBC (zone of inhibition) values of CHX gluconate against five oral bacteria where L. acidophilus and L. fermentum have shown significantly higher MIC values and S. oralis and C. albicans has shown lowest values [Graph 2]. Inhibition zone seen with L. acidophilus and L. fermentum was widest and S. oralis have shown narrowest inhibition zone. No remarkable differences in inhibition zones were seen with S. mutans and C. albicans group, respectively. [Table 4] shows measurement of inhibition zones that are ranked in four categories depending on proportional distribution of the data set, namely, (1) No inhibition (N), (2) Weak inhibition (W), (3) Medium inhibition (M), and (4) Strong inhibition (S). [Table 5] shows inhibition zone of five oral bacteria against T. ammi oil (experimental material) and CHX (gold standard) in terms of efficacy. 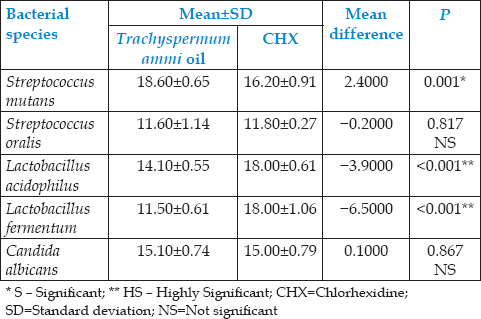 [Table 6] shows intergroup comparison of T. ammi oil (experimental material) and CHX (gold standard) against five oral bacteria. S. mutans shows mean inhibition zone diameter of 18.60 ± 0.65 mm against T. ammi oil and at 16.20 ± 0.91 mm against CHX. S. oralis shows mean inhibition zone diameter of 11.60 ± 1.14 mm against T. ammi oil and at 11.80 ± 0.27 mm against CHX. L. acidophilus shows mean inhibition zone diameter of 14.10 ± 0.55 mm against T. ammi oil and at 18.00 ± 0.61 against CHX. L. fermentum shows mean inhibition zone diameter of 11.50 ± 0.61 mm against T. ammi oil and at 18.00 ± 1.06 mm against CHX. C. albicans shows mean inhibition zone diameter of 15.10 ± 0.74 against T. ammi oil and at 15.00 ± 0.79 mm against CHX as shown in [Graph 3]. Aggregation and attachment of oral bacteria onto the tooth and mucosal surface through formation of plaque is one of the major causes for caries initiation, progression, and gingival diseases as well. Apart from mechanical removal of plaque, many therapeutic agents have been tried for long time as an adjunctive therapy to control colonization and growth of plaque-forming bacteria in the oral cavity. Therapeutic agents such as CHX, Listerine, and cetyl pyridinium chloride are derived chemically, of which CHX is considered as one of the safest adjunctive chemotherapeutic agents for plaque control. However, there are some disadvantages documented with its use such as tooth and restoration staining, burning sensation of oral mucosa, alteration of taste, mucosal irritation, parotid swelling, and enhanced supragingival calculus formation triggered a need to search a better alternative agent which will minimize the disadvantages associated with previously used agents while maintaining highest degree of safety to biological tissues and exert high efficacy against pathogenic oral bacteria. In this experimental study, we used CHX gluconate (2%) as positive control and T. ammi oil as experimental material against five oral bacteria. We prepared a stock solution of 0.1 mg/ml concentration of T. ammi oil as well as CHX gluconate solution that contains 12.5 mg of total concentration of active ingredient in both solutions, respectively, and through double dilution method, ten concentration ranging from 1000 μg/ml to 1.95 μg/ml. We observed that T. ammi oil inhibits growth of S. mutans at 250 μg/ml concentration, S. oralis at 125 μg/ml, L. acidophilus at 250 μg/ml, L. fermentum at 125 μg/ml, and C. albicans at 250 μg/ml, whereas CHX inhibited the growth of S. mutans at 250 μg/ml, S. oralis at 125 μg/ml, L. acidophilus at 500 μg/ml, L. fermentum at 500 μg/ml, and C. albicans at 500 μg/ml. We did not find any statistically significant difference of antibacterial activity for both against S. mutans and S. oralis. On the other hand, T. ammi oil showed higher inhibitory effect against L. acidophilus, L. fermentum, and C. albicans when compared against comparing with positive control group [Table 2] and [Table 3]. We determined MBC by measuring width of inhibition zone on Mueller–Hinton Agar and ranked arbitrarily depending on proportional distribution of the data set. C. albicans in T. ammi group revealed highest zone of inhibition showing medium inhibition (M), whereas L. acidophilus and L. fermentum in CHX group showed highest zone of inhibition indicating medium inhibition (M). Both the groups showed lowest zone of inhibition with S. oralis indicating weak inhibition (W). CHX digluconate is, to date, the most thoroughly studied and most effective antiplaque agent. It is widely used and is considered to be the gold standard due to its broad-spectrum antimicrobial activity. It is a cationic biguanide having substantivity property and even at higher concentration has very low toxicity because of least systemic absorption and excreted unabsorbed and unchanged through gut. However, it is bacteriostatic at low concentration and bactericidal at higher concentrations (at 2%). CHX destabilizes the bacterial cell wall and interferes with osmosis. Bacterial uptake of CHX is very fast which facilitates rupture of the cell wall and finally cytoplasmic membrane causing cell death. T. ammi fruit yields 2%–4% T. ammi oil which on purification becomes a mixture of some essential oil that contains thymol (35%–60%) and other nonthymol compounds such as para-cymene, β-terpinene, α- and β-pineneas, dipentene, α-terpinene, and carvacrol. It also contains camphene, myrcene, and α-3-carene in minute quantities. The possible explanation for antimicrobial activity of T. ammi oil might be because of major ingredients thymol and carvacrol. Thymol kills bacteria resistant to even prevalent third-generation antibiotics and multidrug-resistance microbial pathogens. Khan et al. reported that antibacterial action of T. ammi extract on S. mutans is due to (4As, 5R, 8aS) 5, 8a-di-1-propyl-octahydronaphthalen-1-(2H)-1 a novel compound. This compound showed its activity against S. mutans by significantly reducing its adherence as well as biofilm formation, insoluble glucan synthesis GF and hydrophobicity. Antibacterial effects of T. ammi oil against other bacteria might be due to thymol that damages membrane integrity with changes of Ph hemostasis and equilibrium of inorganic ions. Impaired membrane structure leads to intracellular adenosine triphosphate leakage, loss of cytoplasmic material and potassium. Thus, it alters cell surface morphology through disturbed bacterial cell metabolism. P-cymene, a hydrophobic molecule, the third most common element present in T. ammi oil does not show inherent antimicrobial activity; however, it catalyzes the activity of phenolic compounds along with thymol-enhancing swelling of the cytoplasmic membrane.,T. ammi oil was found very effective against C. albicans. In this study, the possible result for its antifungal activity against C. albicans is given by Sharifzadeh et al. They stated that T. ammi oil affects the lag phase of the microorganisms (growth cycle) where these yeast try to adapt themselves to environmental growth conditions. In this phase, the cells synthesize RNA, enzymes required for microbial cell cycle along with other critical molecules that are required for upcoming exponential phase of cell cycle. T. amm oil disturbs all these phases affecting individual yeast cell to mature thus rendering them unable to divide. However, the exact role of T. ammi oil against lactobacilli is not well understood till now and we believe that the antibacterial role may be similar to the abovementioned mechanisms by Khan et al. and Sharifzadeh et al. S. oralis showed least zone of inhibition against both the antibacterial agents. The reason for this outcome can be explained as follows. S. oralis along with other non-MS strains and S. mutans constitutes the “low pH streptococci group.” Most non-MS have adhesins that adhere to proteins and sugar chains of acquired pellicles coating the tooth surface. In addition to that non-MS can metabolize various sugars producing acids and store extrasugars in the form of intracellular polysaccharides. They can utilize intracellular polysaccharides to produce acids when sugar is limited. Byers et al. observed the presence of high molecular weight aggregate, that is, sailadase, an intracellular enzyme having broad-spectrum optimum and substrate specificity in this bacteria. Thus, the presence of adhesins along with layer of acquired pellicle, intracellular polysaccharides, or sailadase might be responsible for enhancing resistance of S. oralis against chemical insults for extended period of time. 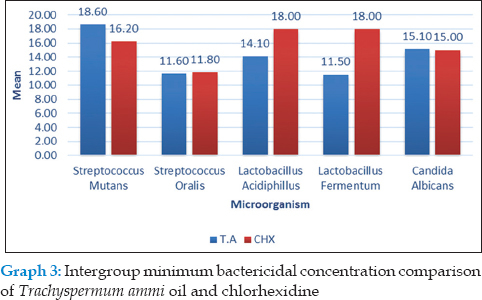 In our experimental study, we found that T. ammi oil has comparable antibacterial activity against oral bacteria than CHX. It has shown significantly higher bacteriostatic and bactericidal efficacy at the same concentration of CHX. However, results obtained in this study were quite interesting. T. ammi oil is available naturally and abundantly. It is nonirritating and nontoxic to the human body. It is cheaper than artificially formulated CHX. We propose that T. ammi oil can also be used in the future as an effective antiplaque agent due to its antimicrobial profile against oral plaque-forming bacteria after exploring its biological and chemical profile in detail. However, results obtained here are not sufficient to conclude its utility right now. Therefore, we recommend further detail in vitro and as in vivo studies to evaluate and ensure effective therapeutic dosage of the same. Khan R, Zakir M, Khanam Z, Shakil S, Khan AU. Novel compound from Trachyspermum ammi (Ajowan caraway) seeds with antibiofilm and antiadherence activities against Streptococcus mutans: A potential chemotherapeutic agent against dental caries. J Appl Microbiol 2010;109:2151-9. Thomas A, Thakur S, Mhambrey S. Comparison of the antimicrobial efficacy of chlorhexidine, sodium fluoride, fluoride with essential oils, alum, green tea, and garlic with lime mouth rinses on cariogenic microbes. J Int Soc Prev Community Dent 2015;5:302-8. Bairwa R, Sodha RS, Rajawat BS. Trachyspermum ammi. Pharmacogn Rev 2012;6:56-60. Nalawade TM, Bhat KG, Sogi S. Antimicrobial activity of endodontic medicaments and vehicles using agar well diffusion method on facultative and obligate anaerobes. Int J Clin Pediatr Dent 2016;9:335-41. Reddy S, Ramakrishna Y. Evaluation of antimicrobial efficacy of various root canal filling materials used in primary teeth: A microbiological study. J Clin Pediatr Dent 2007;31:193-8. Kriplani R, Thosar N, Baliga MS, Kulkarni P, Shah N, Yeluri R, et al. Comparative evaluation of antimicrobial efficacy of various root canal filling materials along with aloevera used in primary teeth: A microbiological study. J Clin Pediatr Dent 2013;37:257-62. Sharifi-Mood B, Shafaghat M, Metanat M, Saeidi S, Sepehri Rad N. The inhibitory effect of Ajowan essential oil on bacterial growth. Int J Infect 2014;1:e19394. Qaiyumi S. Macro and microdilution methods of antimicrobial susceptibility testing. In: Schwabe R, Steele-Moore L, Goodwil AC, editors. Antimicrobial Susceptibility Testing Protocols. United State of America: CRC Press; 2007. p. 75-9. McBain AJ, Bartolo RG, Catrenich CE, Charbonneau D, Ledder RG, Gilbert P, et al. Effects of a chlorhexidine gluconate-containing mouthwash on the vitality and antimicrobial susceptibility of in vitro oral bacterial ecosystems. Appl Environ Microbiol 2003;69:4770-6. Balappanavar AY, Sardana V, Singh M. Comparison of the effectiveness of 0.5% tea, 2% neem and 0.2% chlorhexidine mouthwashes on oral health: A randomized control trial. Indian J Dent Res 2013;24:26-34. 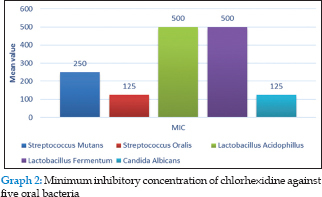 Swadas M, Dave B, Vyas SM, Shah N. Evaluation and comparison of the antibacterial activity against Streptococcus mutans of grape seed extract at different concentrations with chlorhexidine gluconate: An in vitro study. Int J Clin Pediatr Dent 2016;9:181-5. Omidpanah S, Vazirian M, Hosseinkhani F, Hadjiakhondi A, Pirali Hamedani M, Manayi A. Antibacterial activity of essential oil of Trachyspermum ammi (L.) Sprague ex Turrill against isolated and standard bacteria. Am J Essent Oils Nat Prod 2016;4:5-11. 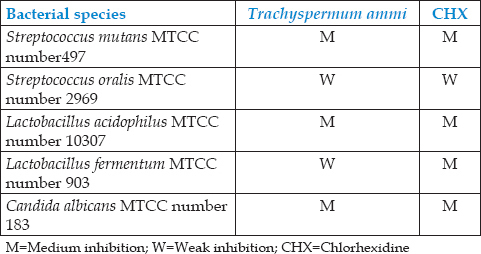 Chahal KK, Dhaiwal K, Kumar A, Kataria D, Singal N. Chemical composition of Trachyspermum ammi L. and its biological properties: A review. J Pharmacogn Phytochem 2017;6:131-40. Hassanshahian M, Bayat Z, Saeidi S, Shiri Y. Antimicrobial activity of Trachyspermum ammi essential oil against human bacterial. Int J Adv Biol Biomed Res 2014;2:18-24. Thosar N, Basak S, Bahadure RN, Rajurkar M. Antimicrobial efficacy of five essential oils against oral pathogens: An in vitro study. Eur J Dent 2013;7:S71-7. Sharifzadeh A, Khosravi AR, Shokri H, Sharafi G. Antifungal effect of Trachyspermum ammi against susceptible and fluconazole-resistant strains of Candida albicans. J Mycol Med 2015;25:143-50. Takahashi N, Nyvad B. Caries ecology revisited: Microbial dynamics and the caries process. Caries Res 2008;42:409-18. Banas JA, Zhu M, Dawson DV, Blanchette DR, Drake DR, Gu H, et al. 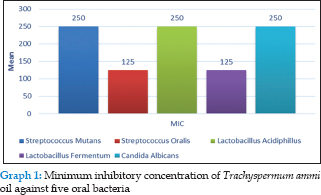 Acidogenicity and acid tolerance of Streptococcus oralis and Streptococcus mitis isolated from plaque of healthy and incipient caries teeth. J Oral Microbiol 2016;8:32940. Byers HL, Tarelli E, Homer KA, Beighton D. Isolation and characterisation of sialidase from a strain of Streptococcus oralis. J Med Microbiol 2000;49:235-44.